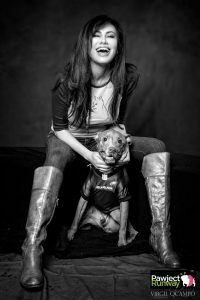 Some people might be riding high after closing out an event that attracted a record number of guests and raised $190K for Baltimore’s homeless animals, but I’m afraid I’m not one of them. Instead of an adrenalin rush, I woke up the next morning feeling sad, deflated and down. 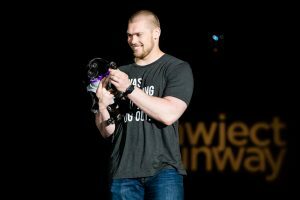 Because when Pawject Runway comes to a close, it means our Softies scatter back to their respective cities across the country and it will be another 365 days before we see them all together again. Every year, that’s a gut wrenching reality for me to accept. 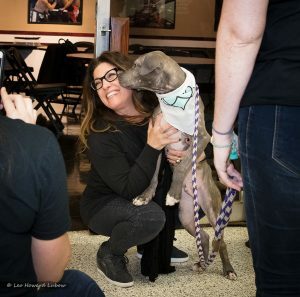 There is no way to overstate how much these animal-loving men and women have come to mean to me personally, and to the efforts of Soft Side as a whole. 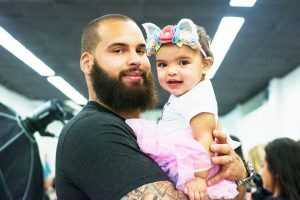 Audiences may get a glimpse on the runway, but that’s just a snippet of who these Softies really are. This year, the festivities started the night before when we hosted a private dinner for our models. Held at Jimmy’s Famous Seafood (Ground Zero of Softieville) they came from Philly, Charlotte and Foxboro to catch up, hang out and get their marching orders (not to mention, their Rescue Strong t-shirts) for the next evening. Recently, we’ve taken to using the hashtag #teamsoftside, but it’s so much more than just an ad slogan. There is a camaraderie among our Softies that’s beautiful to behold. 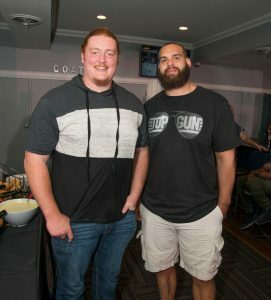 That was evident when Alex Lewis, Tackle for the Ravens walked in and saw Ryan Jensen, Center for the Tampa Bay Buccaneers. “Big Red,” he yelled from across the room and launched into the most heartfelt bear hug on earth, followed by Eskimo kisses for baby Wyatt. Having arranged the dinner on a shoestring budget meaning cheap & cheerful, Ryan took matters into his own hands. 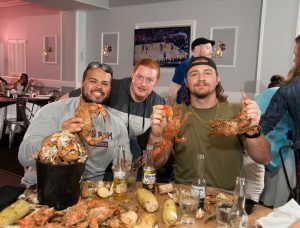 “Steamed crabs all around,” he declared and was soon showing former teammates like Jermaine Eleumunor how to maneuver this Baltimore tradition. Next came Torrey & Chanel Smith with TJ and little Kam – who only had eyes for Aladdin. 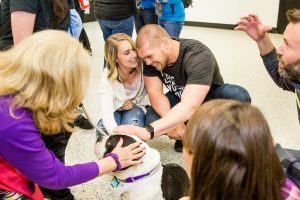 At one point, Torrey asked me, “Is he okay?” I said, “Don’t worry, Aladdin is a therapy dog and incredibly gentle.” “I’m not talking about Aladdin,” Torrey responded. 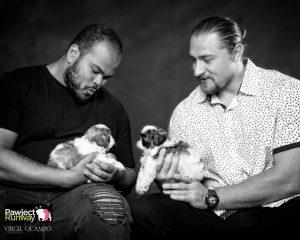 “I’m talking about Kam – he can be pretty rough.” No worries on that front, Kam gently stroked Aladdin and eventually, weaseled his way into his dog bed. 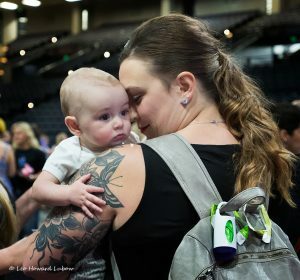 When Lawrence and Andrea Guy arrived with Adriana – the entire room erupted into goo goo mode all over again and fought for turns to hold the little super model. 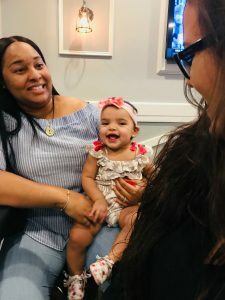 Jasmine McClellan won out and bounced Adriana on her knee to a chorus of giggles. The ladies from Pit Sisters got to personally thank Torrey and Lawrence for their help with the TAILS Program. 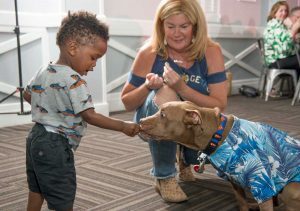 Rebecca Corry and Brandon McMillan got reacquainted five years after crossing paths at a Best Friends event. 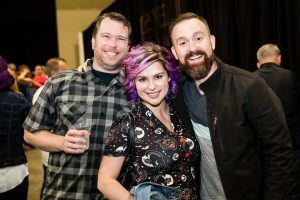 Ryan Jensen lamented that team practice meant missing this year’s Stand Up For Pits, and we got to hug our Soft Side friends who had made the trek from New York, Seattle and Jacksonville. It was a night where old friendships were renewed, new ones made, and all of it set a very special 48 hours in motion. 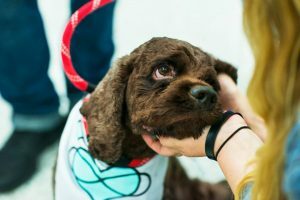 Early Saturday morning, Dan Tillery touched down and, in spite of a night of no sleep thanks to a gig the night before, headed straight to BARCS to give the shelter dogs a private concert. 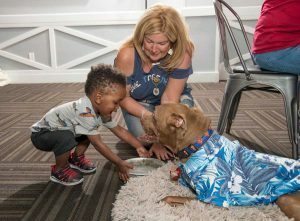 Aladdin and his Mom, along with Lucy Noland from Fox 29 in Philly also went to BARCS for a tour and a glimpse at what an urban, open admission shelter can accomplish with enough passion and heart. 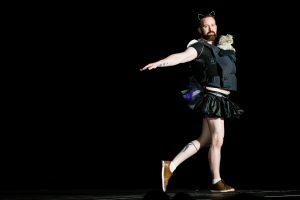 The rest of us headed to Royal Farms Arena to set up for that night’s 6th Annual Pawject Runway. I showed him the backstage route to the Cuddle Corner and sure enough at 6:45 – that’s where the Governor headed. And no folks, it wasn’t a PR stunt as some have implied. 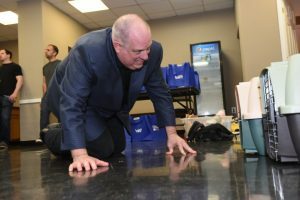 After losing his four-legged baby the year before, the Governor wanted some one-on-one puppy time and didn’t think twice about getting down on his hands and knees to get it. For me, most of the evening was a blur, but certain moments jump out. The first was when one of the volunteers said there was a gentleman in the Cuddle Corner who had been there a long time and could they ask him to move along? 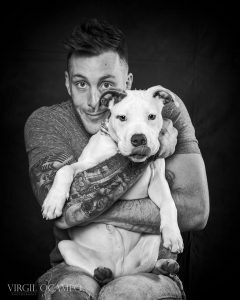 That gentleman turned out to be Alex Lewis, dad to two rescue dogs and one rescue kitty. Given a choice between the VIP lounge or a playpen full of dogs, it was a no brainer where he’d end up. The same holds true for virtually every one of the Softies. 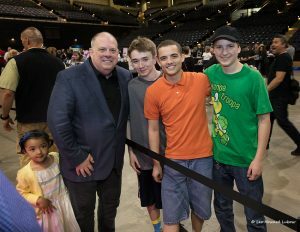 Lawrence Guy made a beeline for a group of kids that he’d taken under his wing while still in Baltimore. 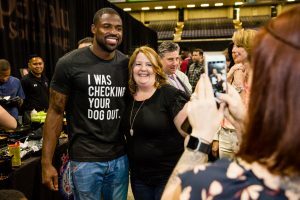 Nick Boyle gave belly rubs to every dog he could find and Rasheed Bailey shared stories of how Pawject Runway had launched his love affair with dogs. Torrey posed for selfies with fans and the Governor photobombed others. 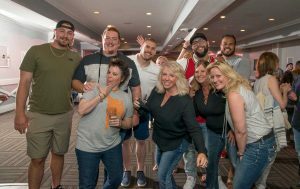 In fact, when we sold out of VIP tickets in the first 36 hours, I tried to tell people – yes, the food & drink in the lounge are fabulous (compliments of Jimmy’s Famous Seafood, Capital Grille, The Food Market & Iron Rooster), but it’s not like the Softies hole up there. Instead they’re out on the floor with everybody else giving head bonks to kitties, loving on pups and thanking both guests and volunteers. It’s not until 7:30 when we pull the models backstage that the Softies actually learn who their partners will be. 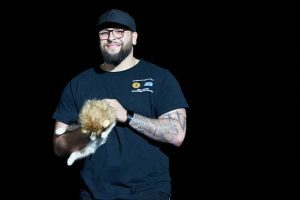 That’s when Nico Siragusa first discovered he’d be escorting a kitty. 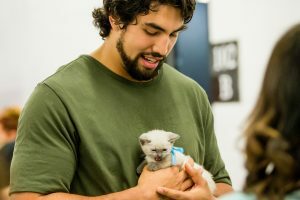 “That’s okay, I like all animals, but you know I’m a dog person at heart.” “Yes Nico, I know, but I guarantee you walk that runway with a kitten and every woman in this place will be smiling.” If truth be known, Nico is the kind of guy who generates smiles whether he’s holding a cat, dog or kangaroo. 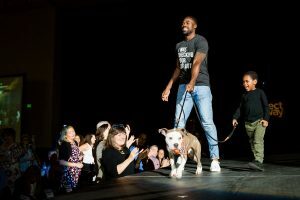 On Pawject Runway night, even the little ones come dressed to kill. Adriana Guy was wearing a onesie “you had me at woof” and flowered kitten ears. Wyatt Jensen was repping his big sisters Bella & Ruby with patterned pit bulls from his chubby cheeks to his little baby toes. 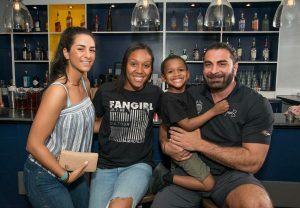 My biggest disappointment was that Kam Smith had taken sick overnight so Chanel stayed with him while Torrey & TJ attended the event. At four years old, TJ is no longer so keen on dancing for 1,400+ people, but he still is a stone cold charmer to everyone he meets. One by one, they took to the runway. Some danced, some strutted and others were so busy looking down at their four-legged partners that not even our professional photographers could get a good shot. And then, all of a sudden – it was over. Six months of planning, four weeks of 24/7 locking down details and 48 hours of sheer joy had just come to an end. That’s a side to our Softies that no audience will ever see. And it’s why I’ve come to adore and admire this group of men and women more than I can ever say. 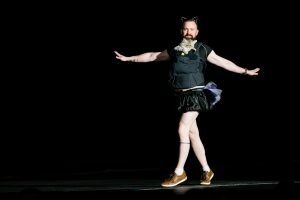 Here’s hoping next year’s Pawject Runway comes soon. 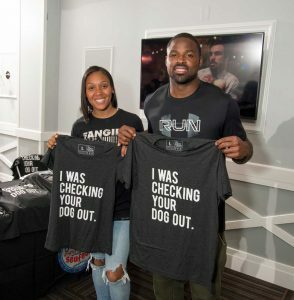 Postscript: For those who don’t know, Torrey Smith, Ryan Jensen & Lawrence Guy all wanted to pay the adoption fees that night. 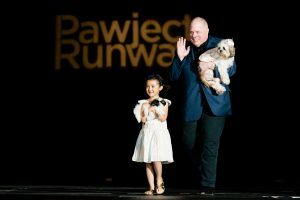 I learned about it as each was about to step foot on the runway and, although none wanted to make a big deal out of it, it’s one more way they’re quietly making a difference in people’s lives whether they walk on two feet or four paws.